There is no doubt the next wave of exciting technology will take the form of artificial intelligence (or as Steven Spielberg calls it, A.I., but I will just call it AI to avoid all the punctuation). Microsoft just wrapped its IT-focused Ignite conference with Satya Nadella pronouncing the democratization of AI. Of course, Google, Apple, Amazon, and other tech heavyweights have their sights set on these technologies as well, but where does AI fit with IT? Many years ago, I had to contact tech support for a well-known company that I shall not name. The wait on hold was so long I just hung up, but after some searching I found a chat option. One click later, a little window pops up followed by a little door chime sound, and then a kindly note appears: "Hi I'm Larry and excited to help you today! What can I do for you?" If there were a mirror in the room, I could enjoy my smug look while thinking the future has finally caught up and we can get rid of phone lines. Later in the conversation, I would be looking to rub the smug look off the scam artist executive who thought putting Larry on the website was a good idea. The thing is, Larry was what we call a chat bot. Chat bots are indeed quite powerful and can fool the layperson. Have a problem with your cable connection? Larry will helpfully advise you to unplug the box and plug it back in. Is your email down? No problem, Larry will guide you through connecting your computer to the Internet. Unfortunately, things got real rocky when Larry-bot had to speak with me because I knew what I was doing. I already did the things Larry wanted me to do. Larry forced me through the steps whether I liked it or not. If Larry felt some aggression from me, he would just spit out links to FAQs and other content that matches a predefined set of keywords. Larry never did help me, and after a half-hour, I was infuriated with his lackadaisical attitude toward me. It was not until I ended the conversation and started up a new chat with Sally that I put 2+2 together. Ahaha! Sally-bot was just the female version of the same Larry-bot software. In short, bots are not that hot at providing technical support for anything but basic conversations. The good news is bots can be helpful if someone already knows they are chatting with a bot and have a solid understanding of what they need. Wait, isn't AI more than just a bot? AI and machine learning are commonplace for addressing significant problems [at scale, as they say in the biz]. You will find AI in use for every search you make online or every photo you upload to the cloud. (That's right, AI is reading your pictures and figuring out the contents of it.) More important, you will find AI helping to solve problems in biosciences for cancer treatments and the financial sector to help rich people get much richer. A Sphynx cat, left, and a Persian cat, right. Can a bot tell the difference? So yes, AI is much more than a bot, but here's the rub: You need to feed a lot of information into machines so they can learn and predict outcomes. For example, an AI system cannot recognize a cat until you explain what a cat is and feed the computers thousands -- or millions -- of cat pictures. 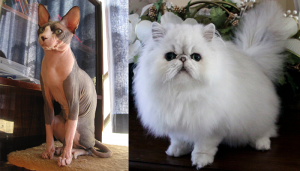 Further, AI has no idea you have a hairless Sphynx cat (shiver) or a fluffy Persian cat (aww!) until you feed that computer with even more details of these different breeds. So why just the bot conversation for IT? If you run a business whose lifeblood is data, you may already use AI. For example, airlines use a form of AI to manage logistics; oil companies can use AI to predict demand and pricing, and so on. Those use cases are specialized services that are truly run by the business to keep things running. IT has dozens or thousands of servers and probably double that number of apps to fulfill the niche needs of each department. All those apps are unique, with their databases, their methods for tracking information, and their unique workflows. In the future, one could imagine sitting at their desk and speaking aloud Larry, "Larry, license me a new SAP environment and set it up for our offices in Europe.". Once that conversation is complete, Larry hops into action and starts configuring everything for you. Sounds great right? Well, truth be told, there is far too much that Larry cannot do in this scenario. Larry would have to negotiate licensing, get budget approvals, allocate systems, and somehow figure out how to configure SAP. 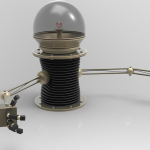 This Star Trek vision may one day be a reality, but today, Larry-bot is going to start with the simple stuff. Microsoft's new Azure Bot framework, allows you to create a bot experience that allows a human being to communicate in a chat window. To build on IT investments, Microsoft makes sure these bots can work in modern messaging apps like Skype and Slack. To remove more development headaches, Microsoft is also building out Flow, which is a lightweight workflow tool similar to Zapier and IFTT. Right now, most of the bots in Microsoft's directory are message-based games or proof-of-concept bots, but the idea is you will be able to offer bots as a jumping off the point for AI. SAP, Salesforce, SharePoint, and many other products are offering these things called hooks (also referred to as webhooks) that let you easily create simple interactions between one app and another. That Larry-bot may not have been helpful for open-ended questions, but what if you create a laser-focused approach that meets particular use cases? Here is a real-world example. Salespeople love Salesforce, but traversing the user interface just to grab a customer contact, pull a report or add a new contact can be time-consuming. Time is money, right? When I was leading IT teams as a full-time job, client-server became the big thing. Then, after the dawn of the Internet, everyone realized these always-connected systems probably weren't such a hot idea. When the internet came along, everyone realized we needed to de-couple these applications. This de-coupling allows vendors to be agiler in delivering their solutions and enables this new wave of cloud computing we are currently in. To truly integrate AI and machine learning into the whole of your IT infrastructure, you will need a system that can access all your applications, understand their purpose, and know how to integrate with them. Putting all these applications and data into the cloud is the first step toward giving machines the information they need to understand your business deeply. That computer will understand the context and help you get the information you need. Right now, bots that meet a point solution (help a salesperson get their leads, help a manager get their budget from SAP) and are a jumping-off point to AI. If you have an application using modern webhooks and APIs (application programming interfaces), then you can start investigating bots today. As IT leaders, we need to demand our vendors open their systems and embrace AI concepts. Until then, you will never be ordering Larry-bot to deploy your code, release the marketing plan and send a drone to your office with a tasty Snickers bar in tow.